This article is about the book. 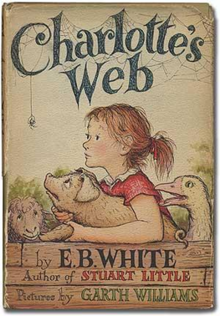 For other uses, see Charlotte's Web (disambiguation). ^ "Private Tutor". Factmonster.com. Retrieved 2014-05-25. ^ "Charlotte A. Cavatica: Bloodthirsty, Wise And True". NPR. Retrieved 2010-09-26. ^ Kinghorn, Norton D. (Spring 1986). "The Real Miracle of Charlotte's Web". Children's Literature Association Quarterly. 11 (1): 4–9. doi:10.1353/chq.0.0418. ISSN 1553-1201. ^ Ratelle, Amy (2014). "Ethics and Edibility in Charlotte's Web". The Lion and the Unicorn. 38 (3): 327–341. doi:10.1353/uni.2014.0026. ISSN 1080-6563. ^ Mills, Sophie (2000). "Pig in the Middle". Children's Literature in Education. 31 (2): 107–124. doi:10.1023/A:1005178904342. ISSN 0045-6713. ^ Thomas, Trudelle H. (2016). "The Arc of the Rope Swing: Humour, Poetry, and Spirituality in Charlotte's Web by E.B. White". International Journal of Children's Spirituality. 21: 201–215. ^ Jordan, Anne Devereaux (1997). "Appreciating "Charlotte's Web"". Teaching and Learning Literature with Children and Young Adults. 7. ^ Misheff, Sue (1998). "Beneath the Web and Over the Stream: The Search for Safe Places in Charlotte's Web and Bridge to Terabithia". Children's Literature in Education. 29. ^ Scully, Matthew (June 2011). "Tangled Web; A Children's Classic, and the Moral Dimensions of Animal Farming. (The Story of Charlotte's Web: E. B. White's Eccentric Life in Nature and the Birth of an American Classic)". The Weekly Standard. 16. ^ White, E. B. (2006). "Authors & illustrators: E. B. White: AUTHOR NOTE: A Letter from E. B. White". harpercollinschildrens.com. HarperCollins Publishers. Retrieved 2009-05-31. ^ Nordstrom, Ursula (1974-05-12). "Stuart, Wilbur, Charlotte: A Tale of Tales". The New York Times. Retrieved 2008-12-22. ^ White, E.B. (January 1948). "Death of a Pig". The Atlantic. Retrieved 2011-08-30. ^ Weales, Gerald (1970-05-24). "The Designs of E. B. White". The New York Times. Retrieved 2008-12-22. ^ Usher, Shaun. "A book is a sneeze". Letters of Note. Retrieved 6 August 2013. ^ Elledge, Scott (1984). E. B. White: A Biography. W. W. Norton and Company. ISBN 978-0-393-01771-7. ^ a b Neumeyer, Peter F. (1991). "Charlotte, Arachnida: The Scientific Sources". The Lion and the Unicorn. 19 (2): 223–231. doi:10.1353/uni.1995.0034. ISSN 0147-2593. ^ a b Elledge (1984), p. 295. ^ White (1976), p. 351. ^ Garfield, Henry (May 2007). "E.B. White's Web". Bangor-Metro. Archived from the original on 2009-01-13. Retrieved 2009-06-17. ^ Lerer, Seth (2008). Children's Literature. University of Chicago Press. pp. 249–251. ISBN 978-0-226-47300-0. ^ Larrick, Nancy (1982). A Parent's Guide to Children's Reading (Fifth ed.). Philadelphia, Pennsylvania: The Westminster Press. p. 67. ISBN 978-0-664-32705-7. ^ Cole, Henry (2005). The Art of Reading: Forty Illustrators Celebrate RIF's 40th Anniversary. Compiled by Reading Is Fundamental. Dutton Books. p. 33. ISBN 978-0-525-47484-5. ^ Bluthenthal, Diana Cain (2005). The Art of Reading: Forty Illustrators Celebrate RIF's 40th Anniversary. Compiled by Reading Is Fundamental. Dutton Books. p. 30. ISBN 978-0-525-47484-5. ^ a b Ames, Katrine; Marc Peyser (1991-12-09). "For Little Pitchers With Big Ears". Newsweek (24): 79. ISSN 0028-9604. ^ a b Schnol, Janet; Joanne Tangorra (1991-10-18). "Bantam Releases CD/Cassette of E. B. White Titles". Publishers Weekly. 238 (46): 32. ISSN 0000-0019. ^ Worldly Web: A traveling spider teaches fourth graders the joys of reading, meeting new people, and experiencing new adventures. Readers Digest 2007-06-13, page found 2012-11-13. ^ Fisher, Douglas; et al. (2004). "Interactive Read-Alouds: Is There a Common Set of Implementation Practices?" (PDF). The Reading Teacher. 58 (1): 8¬–17. doi:10.1598/rt.58.1.1. Archived from the original (PDF) on December 7, 2013. Retrieved August 19, 2012. ^ Bird, Elizabeth (July 7, 2012). "Top 100 Chapter Book Poll Results". School Library Journal "A Fuse #8 Production" blog. Retrieved August 19, 2012.